For other uses, see Helios (disambiguation). "Helius" redirects here. For the crane fly, see Helius (insect). "Pyrois" redirects here. For the moth, see Pyrois (moth). Helios (/ˈhiːli.ɒs/; Ancient Greek: Ἥλιος Hēlios; Latinized as Helius; Ἠέλιος in Homeric Greek) was the personification of the Sun in Greek mythology. He is the son of the Titan Hyperion and the Titaness Theia (according to Hesiod), also known as Euryphaessa (in Homeric Hymn 31) and brother of the goddesses Selene, the moon, and Eos, the dawn. Helios was described as a handsome titan crowned with the shining aureole of the Sun, who drove the chariot of the sun across the sky each day to earth-circling Oceanus and through the world-ocean returned to the East at night. In the Homeric hymn to Helios, Helios is said to drive a golden chariot drawn by steeds (HH 31.14–15); and Pindar speaks of Helios's "fire-darting steeds" (Olympian Ode 7.71). Still later, the horses were given fiery names: Pyrois, Aeos, Aethon, and Phlegon. The Greek ἥλιος is the inherited word for the Sun, from Proto-Indo-European *sóh₂wl̥, cognate with Latin sol, Sanskrit surya, Old English swegl, Old Norse sól, Welsh haul, etc. Among these is Hyperion (superus, "high up"), Elektor (of uncertain derivation, often translated as "beaming" or "radiant"; especially in the combination elektor Hyperion), Phaëton "the radiant", Hekatos (of Apollo, also Hekatebolos "far-shooter", i.e. the sun's rays considered as arrows). The best known story involving Helios is that of his son Phaethon, who attempted to drive his father's chariot but lost control and set the earth on fire. Helios was sometimes characterized with the epithet Panoptes ("the all-seeing"). In the story told in the hall of Alcinous in the Odyssey (viii.300ff. ), Aphrodite, the consort of Hephaestus, secretly beds Ares, but all-seeing Helios spies on them and tells Hephaestus, who ensnares the two lovers in nets invisibly fine, to punish them. You will now come to the Thrinacian island, and here you will see many herds of cattle and flocks of sheep belonging to the sun-god. There will be seven herds of cattle and seven flocks of sheep, with fifty heads in each flock. They do not breed, nor do they become fewer in number, and they are tended by the goddesses Phaethusa and Lampetia, who are children of the sun-god Hyperion by Neaera. Their mother when she had borne them and had done suckling them sent them to the Thrinacian island, which was a long way off, to live there and look after their father's flocks and herds. Though Odysseus warns his men, when supplies run short they impiously kill and eat some of the cattle of the Sun. The guardians of the island, Helios' daughters, tell their father about this. Helios appeals to Zeus telling them to dispose of Odysseus' men or he will take the Sun and shine it in the Underworld. Zeus destroys the ship with his lightning bolt, killing all the men except for Odysseus. In one Greek vase painting, Helios appears riding across the sea in the cup of the Delphic tripod which appears to be a solar reference. Athenaeus in Deipnosophistae relates that, at the hour of sunset, Helios climbed into a great golden cup in which he passes from the Hesperides in the farthest west to the land of the Ethiops, with whom he passes the dark hours. While Heracles traveled to Erytheia to retrieve the cattle of Geryon, he crossed the Libyan desert and was so frustrated at the heat that he shot an arrow at Helios, the Sun. Almost immediately, Heracles realized his mistake and apologized profusely, in turn and equally courteous, Helios granted Heracles the golden cup which he used to sail across the sea every night, from the west to the east because he found Heracles' actions immensely bold. Heracles used this golden cup to reach Erytheia. By the Oceanid Perse, Helios became the father of Aeëtes, Circe and Pasiphaë. His other children are Phaethusa ("radiant") and Lampetia ("shining"). Helios is sometimes identified with Apollo: "Different names may refer to the same being," Walter Burkert observes, "or else they may be consciously equated, as in the case of Apollo and Helios." The earliest certain reference to Apollo identified with Helios appears in the surviving fragments of Euripides' play Phaethon in a speech near the end (fr 781 N²), Clymene, Phaethon's mother, laments that Helios has destroyed her child, that Helios whom men rightly call Apollo (the name Apollo is here understood to mean Apollon "Destroyer"). 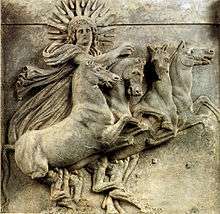 By Hellenistic times Apollo had become closely connected with the Sun in cult. His epithet Phoebus, Phoibos "shining", drawn from Helios, was later also applied by Latin poets to the sun-god Sol. "But having gone down into Hades because of his wife and seeing what sort of things were there, he did not continue to worship Dionysus, because of whom he was famous, but he thought Helios to be the greatest of the gods, Helios whom he also addressed as Apollo. Rousing himself each night toward dawn and climbing the mountain called Pangaion, he would await the sun's rising, so that he might see it first. Therefore, Dionysus, being angry with him, sent the Bassarides, as Aeschylus the tragedian says; they tore him apart and scattered the limbs." Classical Latin poets also used Phoebus as a byname for the sun-god, whence come common references in later European poetry to Phoebus and his car ("chariot") as a metaphor for the sun. But in particular instances in myth, Apollo and Helios are distinct. The sun-god, the son of Hyperion, with his sun chariot, though often called Phoebus ("shining") is not called Apollo except in purposeful non-traditional identifications. Despite these identifications, Apollo was never actually described by the Greek poets driving the chariot of the sun, although it was common practice among Latin poets. Therefore, Helios is still known as the 'sun god' – the one who drives the sun chariot across the sky each day. 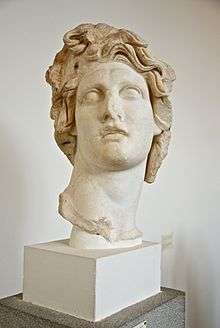 Bust of Alexander the Great as an eidolon of Helios (Musei Capitolini). L.R. Farnell assumed "that sun-worship had once been prevalent and powerful among the people of the pre-Hellenic culture, but that very few of the communities of the later historic period retained it as a potent factor of the state religion." Our largely Attic literary sources tend to give us an unavoidable Athenian bias when we look at ancient Greek religion, and "no Athenian could be expected to worship Helios or Selene," J. Burnet observes, "but he might think them to be gods, since Helios was the great god of Rhodes and Selene was worshiped at Elis and elsewhere." James A. Notopoulos considers Burnet's an artificial distinction: "To believe in the existence of the gods involves acknowledgment through worship, as Laws 87 D, E shows" (note, p. 264). Aristophanes' Peace (406-413) contrasts the worship of Helios and Selene with that of the more essentially Greek Twelve Olympians, as the representative gods of the Achaemenid Persians; all the evidence shows that Helios and Selene were minor gods to the Greeks. "The island of Rhodes is almost the only place where Helios enjoys an important cult", Burkert asserts (p 174), instancing a spectacular rite in which a quadriga, a chariot drawn by four horses, is driven over a precipice into the sea, with its overtones of the plight of Phaethon noted. There annual gymnastic tournaments were held in his honor. 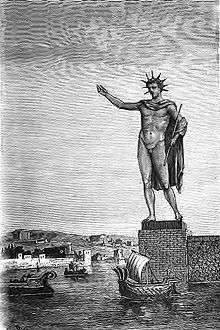 The Colossus of Rhodes was dedicated to him. Helios also had a significant cult on the acropolis of Corinth on the Greek mainland. In Plato's Republic (516 B), Helios, the Sun, is the symbolic offspring of the idea of the Good. In Late Antiquity a cult of Helios Megistos ("Great Helios") (Sol Invictus) drew to the image of Helios a number of syncretic elements, which have been analysed in detail by Wilhelm Fauth by means of a series of late Greek texts, namely: an Orphic Hymn to Helios; the so-called Mithras Liturgy, where Helios rules the elements; spells and incantations invoking Helios among the Greek Magical Papyri; a Hymn to Helios by Proclus; Julian's Oration to Helios, the last stand of official paganism; and an episode in Nonnus' Dionysiaca. Some lists, cited by Hyginus, of the names of horses that pulled Helios' chariot, are as follows. According to Eumelus of Corinth – Eous; by him the sky is turned. Aethiops, as if faming, parches the grain. These trace-horses are male. The female are yoke-bearers: Bronte, whom we call Thunder, and Sterope, whom we call Lightning. According to Homer, the names are : Abraxas, *Therbeeo. According to Ovid: Pyrois, Eous, Aethon, and Phlegon". ↑ helios. Online Etymology Dictionary. ↑ Noted in “epiphanestaton" — the most conspicuous (II. 30. 3-4). See also Franz Boll – Kronos-Helios, Archiv für Religionswissenschaft XIX (1919), p. 344. ↑ Noted in Kerenyi 1951:191, note 595. ↑ Walter Burkert, Greek Religion, p. 120. ↑ Homer,William Cullen Bryant (1809). The Iliad of Homer. Ashmead. ↑ O'Rourke Boyle Marjorie (1991). Petrarch's genius: pentimento and prophecy. University of California press. ISBN 978-0-520-07293-0. ↑ Farnell, The Cults of the Greek States (New York/London: Oxford University Press) 1909, vol. v, p 419f. ↑ J. Burnet, Plato: Euthyphro, Apology of Socrates, and Crito (New York/London: Oxford University Press) 1924, p. 111. ↑ James A. Noutopolos, "Socrates and the Sun" The Classical Journal 37.5 (February 1942), pp. 260-274. ↑ Pausanias. Description of Greece, 2.1.6. ↑ Notopoulos 1942 instances Aeschylus' Agamemnon 508, Choephoroe 993, Suppliants 213, and Sophocles' Oedipus Rex 660, 1425f. ↑ Anaxagoras described the sun as a red-hot stone. ↑ Larissa Bonfante and Judith Swaddling, Etruscan Myths (Series The Legendary Past, British Museum/University of Texas) 2006:77. ↑ Noted by J. D. Beazley, "The World of the Etruscan Mirror" The Journal of Hellenic Studies 69 (1949:1–17) p. 3, fig. 1. ↑ Wilhelm Fauth, Helios Megistos: zur synkretistischen Theologie der Spätantike (Leiden:Brill) 1995. Burkert, Walter (1982). Greek Religion. Kerenyi, Karl (1951). "Apollo: The Wind, the Spirit, and the God: Four Studies". The Gods of the Greeks. Kerenyi, Karl (1951). "The Sun, the Moon and their Family". The Gods of the Greeks. pp. 190–194. et passim. Schauenburg, Konrad (1955). Helios: Archäologisch-mythologische Studien über den antiken. Mann. Smith, William (1873). "He'lios". Dictionary of Greek and Roman Biography and Mythology. London. Wikimedia Commons has media related to Helios.